BoldHeartMama: we. need. a. new. car. We've been on the fence about this for the better part of a year, but with the little guy on the way it suddenly seems imperative. The car seat is in and while I love having Echo power, I think it is safe to say we could use a slightly larger (and newer) car. As you can see it is a tight fit for the car seat. If I were an inch taller (or Jacqueline was a foot or so taller) we'd be in trouble. Roy and I had the same problem with our infant seat in our Mazda. 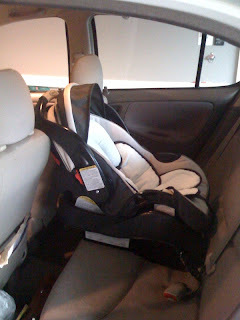 It'll be a lot easier once the baby is in a "big boy" carseat. 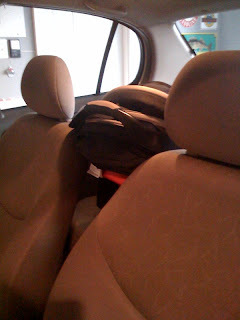 We have a Britax Marathon and it fits great in the Mazda. The sad thing is that the Echo is the better of our cars. So it will be sticking around for a while, J's car on the other hand will hit the road once a new baby mover is part of the fleet.